Dr Ramgopal Agarwala is Chairman of Pahle India Foundation, New Delhi. Dr Agarwala graduated from Presidency College, University of Calcutta, and was a gold medalist in MA Economics. He did his PhD in Econometrics from Manchester University. His thesis was later published in the form of a book An Econometric Model of India that became a staple read in Indian universities. 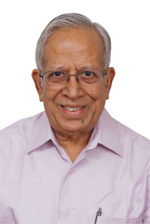 He joined the World Bank in 1971 and worked at various senior positions across several countries in Asia and Africa, including Bangladesh, Kenya, Botswana, the Philippines, Thailand, South Korea and China. He retired from the World Bank after serving as the Chief of the Economic Unit of the World Bank Resident Mission in Beijing. On his return to India, he began working as a consultant for Asian Development Bank, the World Bank and the UN. He was a Distinguished Fellow at the Research and Information System for Developing Countries, New Delhi, a think tank under the Ministry of External Affairs, Government of India. The most noteworthy among Dr Agarwala’s recent publications are India 2050: A Roadmap for Sustainable Prosperity (2014) and The Resurgent India: Ideas and Priorities, a book co-written with Rajiv Kumar and Rajesh Shah and published in 2015.